Vielä lähtiäisiksi kohtalaisen mukiinmenevä bloggaus Libyan tilanteesta. Ranskan harjoittama politiikka vaikuttaa hieman erikoiselta. Laitetaan Suomen Kuvalehdessä julkaistu Nicolas Kayser-Brillin(kuka lie?) äärettömän mielenkiintoinen avaus vallan verkoista tänne koska se aloittaa käsittelemällä Libyan sotareissuun päätymistä. Vielä kirjoituksen alkua ja Bernard-Henri Lévyn yhteyksiä kutkuttavampaa on tekstin lopussa esitelty Influence Networks palvelu jolla kerrotaan voitavan availla vaikuttajien, instituutioiden ja yritysten yhteyksiä toisiinsa. Itse en tosin tuossa lainkaan onnistunut, mutta sen voinee laskea käyttäjän piikkiin tai yrittämiensä nimien merkityksen? En jaksanut tarkistella enempää että miten ja kuka tuota oikein päivittää, eli onko esim. Talvivaaran omistajien kumminkaimojen kissalääkärit jo mahd. piankin tuon avulla koko kansan ihmeteltävissä. SK on kyllä viime aikoina petrannut, journalistisilta ansioiltaan ainakin verkkoversio oli mielestäni ennen lähinnä pohjanoteeraus. Oi Muammar... kuinkahan tuossa on käynyt? Kovin epäselvältä vaikuttaa tässä vaiheessa. "Syrt. Libyan väliaikaishallinnon joukkojen mukaan maan entinen diktaattori Muammar Gaddafi on kuollut kiinniotettaessa. Aiemmin Gaddafin kerrottiin haavoittuneen kiinniotettaessa molempiin jalkoihin. Tietoa ei ole toistaiseksi vahvistettu muista lähteistä. Arabikanava Al Jazeeran lähteiden mukaan Gaddafi on kuollut. Libyan television mukaan Gaddafi on puolestaan nähty vangittuna. Nato on puolestaan ilmoittanut selvittävänsä asiaa." Kyllä on Muammarista tainnut oikeasti henki lähteä. Pääasia, että paha sai palkkansa. Tietysti olisi ollut hyvä saada hänet oikeuden eteen, mutta käyhän se näinkin. but also on the Lido as producer of "The Cat," screening in the Venice Film Market’s Final Cut workshop. were the real me. What kinds of idiots did they think the Venice people are?" started the blood, not the army." to get killed so they could have a body count; so that the U.S. could come and bomb us. What is this? "The Cat" screened for potential investors Saturday. market, "Winter" was sold to HBO Europe by Double Dutch Intl. resigned as minister of defense late on Wednesday, announcing a presidential run he is expected to win. calling it a national duty following the removal of the Muslim Brotherhood-backed Mohammed Morsi in July. with Egypt's return to a military-backed autocracy. was promoted to the rank of general, setting him up to take over as minister of defense. three years of political and economic turmoil. strain Egypt's already rickety electricity grid, resulting in blackouts. in which their attorneys weren't allowed to mount a defense. resulted in the deaths of dozens of soldiers and police. still may have allies there, Mr. Kassem said. "The minute he walks out, he is on his own," he said. joining the Air Force High School in 1970 at age 15.
the multitude of social, economic and political challenges the Arab world's most populace nation faces. the Muslim Brotherhood, the once powerful group Mr. Sisi has cracked down on. we will fight for Egypt's stability, security and hope." made him ideal to lead the country. politics by reshuffling the Supreme Council of the Armed Forces. who had previously served as the head of military intelligence, was the youngest member of the SCAF. political entities in the post-Mubarak era. instrumental in Mr. Mubarak's fall. once powerful group and designated it a terrorist organization. to the sidelines while imprisoning particularly critical voices, including journalists and academics. Marshall Sisi to Moscow, Russian president Vladimir Putin said he endorsed Sisi's expected presidential run. - Leila Elmergawi contributed to this article. "Power resides only where men believe it resides. It's a trick, a shadow on the wall, yet shadows can kill. And ofttimes a very small man can cast a very large shadow." Morsi: What's the military's position concerning what's going on? Is it just going to stand by watching? Shouldn't it protect the legitimacy? of people, according to documented reports, don't want you. Morsi: My supporters are many and they won't be silent. Morsi: What if I don't want to leave? Morsi: But this way it will be a military coup, and America won't leave you alone. Sisi: The people concern us, not America. And since you've started to talk this way, I'll talk to you candidly. national security. The judiciary will have its say and you will all be judged before the whole people. Morsi: Okay, can you permit me to make a few phone calls and then afterwards I'll decide on what to do? Morsi: Don't think the Brotherhood is going to stand by if I leave office. They will set the world on fire. live in peace, he's more than welcome; otherwise, [if they try anything] we will not leave them alone. as fuel for your disgusting war. If you truly love them, leave office and let them go to their homes. Sisi: Anyway, I've advised you. Morsi: Okay, but take care—I'm the one who hired you as minister and can remove you. 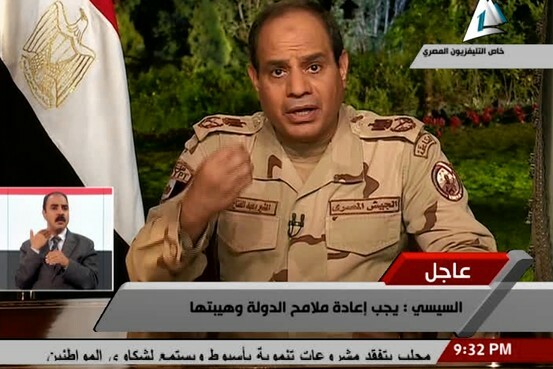 Sisi: I became minister of defense due to the military's will and not yours—and you know this very well. Moreover, you can't remove me; that's it—you no longer have any legitimacy. Sisi: I can't offer you any promises. It's the justice [department] that will pass its verdict. Morsi: Okay, if that's the case, I'll make it war, and we'll see who will prevail in the end.